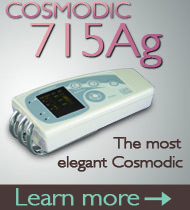 COSMODIC ® technology is one of the latest and one of the most mysterious healing technologies of our times. 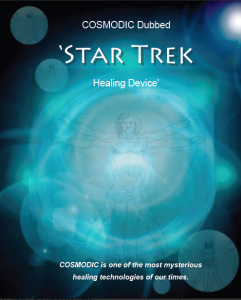 COSMODIC ® devices came out of Russia somewhat 10 years ago and were quickly dubbed ‘Star Trek healing devices’ for their ability to promote not just rapid healing, but also actual REGENERATION in the living systems. COSMODIC ® supports restoration on a cellular level, making the body even stronger than it was before a disease or injury occurred. COSMODIC ® results are often miraculous – and yet, have you heard about it? Most likely, not. This is not surprising, since COSMODIC ® is a holistic energy healing technology, and in the biomedicine-ruled western world it is still a synonym of a medical witchcraft. When you look at the human body from a perspective of contemporary physics, you will not see a sum of replaceable parts. You will see a sophisticated self-controlling, self-regulating, and self-reproducing informational matrix that organizes and directs energy embodied in a physical form. You will see a whole, extremely dynamic, and highly adaptive self-organizing living system that constantly exchanges information, energy, and matter with its environment and evolves dealing with challenges a.k.a. dis-ease, just as described by Ilya Prigogine in his theory of dissipative structures. And from that perspective, where does biomedicine with its God complex and “war on dis-ease” modus operandi stand? The system of THAT level of complexity should not be interfered with in the process of adaptation to challenges; it needs to be assisted, not controlled. They assign to Hippocrates an expression, “The art of medicine is entertaining a patient while nature takes its course.” The father of medicine was a wise man… We in the 21st century, however, can do better than just entertain, because we have COSMODIC ©! We have an electronic system that was designed as an analog of a living system: self-organizing, highly adaptive and dynamic, and with one agenda – to assist another living system in healing. COSMODIC ® is the latest in the evolution of SCENAR technology, which was developed by a brilliant Russian scientist, Dr. Alexander Karasev, in the mid-80s for the Russian Space Research Program. We call COSMODIC ® devices the ‘second generation SCENARs’. 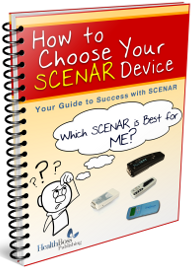 Both SCENAR and COSMODIC ® are low-frequency dynamic adaptive electrical stimulators and, in essence, are Universal Regulators of Bodily Functionsthat jump-start and strengthen the natural healing system of the human body. In doing this, they promote fast recovery from a wide variety of disorders ranging from simple colds and bruises to autoimmune and degenerative diseases. They, however, achieve this agenda in different ways. While SCENAR challenges the body to a stronger healing response by blending its signals with the disease signals (‘adding to pain’, so to speak), COSMODIC ® directly ‘adds to healing’, carefully listening to the body and using micro-resonances to tune into and amplify the body’s own healing efforts. COSMODIC ® awakens and enhances the inherent capacity of the body to recover and regenerate on a cellular level. It is even capable of determining the exact moment when cells switch to the regeneration mode. 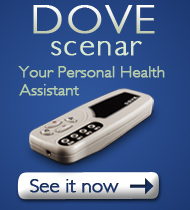 The SHAPE of the electrical impulse that resembles a natural neuro-impulse and allows the devices to TALK to the body. 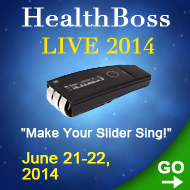 The FEEDBACK feature that determines their ability to HEAR the body. 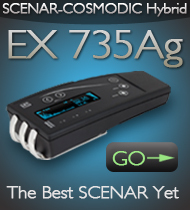 COSMODIC ®, however, is a much better listener than SCENAR; it has 46 feedback channels against only 1 channel in SCENAR. This allows coordination of active impulses of the device with a wide spectrum of the body’s reactions and not just the electrical resistance of the skin (or impedance). 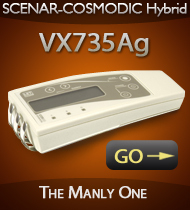 This ability of COSMODIC ® to receive and process large quantities of information from the body also determines a new quality of its impulses, in which the low frequency SCENAR signal is used merely as a carrier for other dynamically changing high frequency oscillations, representing information (‘the spectral saturation’ of the signal). It is just like a radio station: its main wave, which has a fixed frequency, carries information in the form of various other frequencies put on top and perceived as sound. 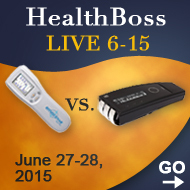 It is ‘information’ that determines the effectiveness of COSMODIC ®, not the stimulation of nervous fibers, as such. 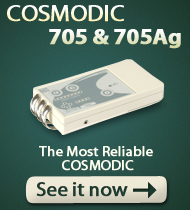 Multidimensional and rich in information COSMODIC ® signals now become more regulating than stimulating. They come in bundles (called adaptive regulatory bundles), which are capable of both stimulating as well as sedating the body processes, thereby, actually mimicking the functions of the Central Nervous System (CNS). And just like the CNS does, COSMODIC ® uses both central and local mechanisms to wake up the cellular memory and enhance the innate capacity of our body to recover, regenerate, and rejuvenate. The body will now REMEMBER and be able to actually REGENERATE versus just forming a scar (which is a standard body’s healing compromise). In Alexander Karasev’s view, COSMODIC ® works somewhat like a tuning fork. It exposes the body to a harmonious tuning system, and since the device has a ‘floating’ signal spectrum, it can tune itself into vibrations and frequencies of any organ or tissue in the body, re-establishing healthy vibrations and a coherent state of functional structures. As in any systemic interaction, the more coherent system (COSMODIC ®) first tunes itself into the state of a less coherent system (the bodily structure) and mirrors it blending vibrations of both systems and creating a new, stronger functional unit (micro-resonances in COSMODIC ® make it possible). This new unit then regains the state of coherence, as COSMODIC ® rebalances itself carrying the body along. The healthy healing and coherent vibrations in this process will be amplified (micro-resonances again) – and when it is achieved, COSMODIC tells you, ‘enough’. In simple terms, COSMODIC ® works like a skillful coach collecting a lot of data, building a mathematical model of the body healing reactions as they are – and as they should be, unlocking the body’s inherent potential, and then gently and tactfully guiding the body to its best performance in healing and regeneration. This is a whole new level of healing, where the body AFTER the disease can become even stronger than it was BEFORE it. Sounds too ‘out there’? Not quite, if, again, we shake off the reductionistic paradigm, forget the Newtonian concept of reality, and move into the world of systems, the world of quantum physics, the string theory, bosons and fermions, supersymmetry, extra dimensions, antimatter, and what not. This is the world of endless possibilities where pretty much ANYTHING is possible. Here is what one of the most controversial physicists of our times Tom Bearden, the author of the Energy from the Vacuum, who did a lot of work in the area of precursor engineering (or the direct engineering of physical reality itself), thinks of the matter. “By deliberate and specific “patterning” of the Dirac sea tickling pulse patterns by which the vacuum in which an object resides is “tickled” to add deliberate patterns of negative energy, one can in theory “change” a physical object in any way desired, just so long as the proper “change pattern” has been worked out and put in one’s available “library of technological tickle patterns” and what each does to what. In humans, we have the world’s greatest “Dirac sea vacuum tickling machine” conceivable, already in our bodies! It is the gigantic collection of ongoing “spikings” of our nerve dendrite endings, all over our bodies… that can potentially “unhappen” any disease or back physical condition, including old age itself. Yes, Dr. Karasev would rather talk about it – but he won’t. Not yet. Here is the second reason for his hesitation about his own and Tom Bearden’s ideas: the world is not ready for it yet. And if it is not, both the COSMODIC ® and his inventor will be put in the ‘pseudo-science’ box, disregarded, and forgotten until better times, times when doctors know more physics and can appreciate where artificial intelligence and the Star Trek healing devices are coming from. The world, however, needs healing NOW. And the Dr. Karasev’s LET Medical Research Laboratory in Russia, where all COSMODIC ® devices are exclusively and carefully crafted, releases it’s children to the world in very limited quantities under a label of “COSMODIC ® adaptive electrical stimulators”, even though the difference between them and other adaptive electrical stimulators on the market is, say, like a difference between a unicorn and a mule. There is no limit to what COSMODIC ® can and will do for you, if you treat it with understanding and respect it deserves. These cell-phone size universal healers can be easily used by anyone, anywhere, and for virtually anything that needs healing and regeneration. According to Tom Bearden, again, some day COSMODIC ® technology may be even used to heal our Mother Earth… In the world of systems and supersymmetry the size really does not matter, does it?